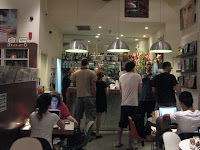 There are so many cafe restaurants here in Tel Aviv, that you must differentiate from others to be noticed. Dizi did this by combining the following services: DVD rental, laundry self-service, wifi internet and food - the ideal scene for the bachelors of Tel Aviv. 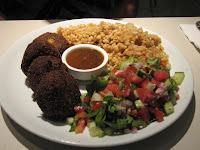 This vegetarian cafe-restaurant has an easy going atmosphere and tasty vegetarian food. The menu contains hot dishes, salads and salad-sandwiches (sandwiches stuffed with salad). The beetroot salad-sandwich is great. We also suggest to order the quinoa salad. For the hot dishes, the tofu balls with wheat and pungent Asian sauce is very much recommended and also the delicious lasagna with spinach and ricotta cheese. Who says that vegetarian food can't be tasty?! Go to the Dizengoff square, and go down the stairs where the cinema is located. * Tip: When you order a salad-sandwich, tell them to put the salad aside and not on the sandwhch, otherwise you'll be eating soggy bread.